Todd’s focus at Oswegatchie is oversight of facility and finances, as well as the management of the NY FFA Leadership Training Foundation. Todd spent a lot of time at Oswegatchie throughout his childhood growing up as an Ag. teacher’s son. He first worked at Oswegatchie in 1989 as a counselor, and has been a part of every summer at Oswegatchie since. Todd holds a masters degree in Education from Cornell University. In 1994 Todd became the first full time year round Oswegatchie employee. He and his wife Shari live and work at Oswegatchie; together they have played an important role in shaping the Oswegatchie of today. They have two daughters and enjoy all that Oswegatchie has to offer them as a family. Their favorite activities include hiking, cross country skiing, and swimming in Long Pond. Bill is the man behind summer camp! He spends his year planning, promoting, hiring and fundraising for summer. Bill started his Oswegatchie adventure as camper and then worked his first summer as a counselor in 1993. In 1999 Bill began to work at Oswegatchie full time and live on the property year round. Bill has his Bachelor’s degree in Environmental Education from Unity College. Robin processes the day to day business in the office. She is the contact for all Oswegatchie retreats and programs. She was also a camper and worked her first summer as a counselor in 2002. Her full time and life on the property started in 2006. Robin has a Bachelor’s degree in Elementary Education from SUNY Oneonta. 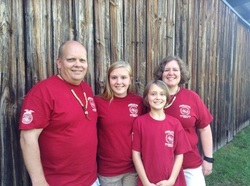 Bill and Robin have two sons and love the opportunity to raise them at Oswegatchie. 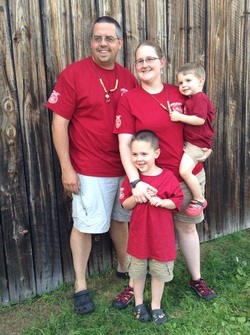 Their favorite family activities are biking, splashing in mud puddles, and exploring the trails around Oswegatchie. Rolland Krohn is the charismatic leader of our ropes course program. In general the ropes course sees at least 2,000 participants a year and Rolland is there to make sure their experience is worthwhile and safe. He also over sees the annual training of 15 ropes staff and the day to day operations at ropes. His family has been a part of Oswegatchie for decades and has been a big part of our summer camp program. 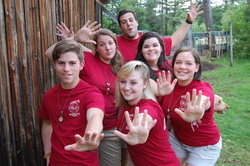 Each summer Oswegatchie hires approximately 30 staff members to fill the various roles for our summer program. Staff come from diverse backgrounds from across NYS and sometimes other northeastern states. Yearly 90 percent of our staff have Oswegatchie or FFA backgrounds. Each staff member goes through an interview, reference check, and background check before they are hired. Once hired all staff arrive on the property before the camping season begins for a 10 day intensive staff training period. Click Here to find a summer camp application.